Facebook’s share of consumer time spent with digital media fell 6% in October vs. the same month in 2017, according to an analysis of Nielsen’s Digital Content Ratings data by Pivotal Research Group. Time spent per Facebook user actually declined 10% during the period, indicating that the social network isn’t just losing share among an expanding market of digital content consumption, but is eroding among users too. 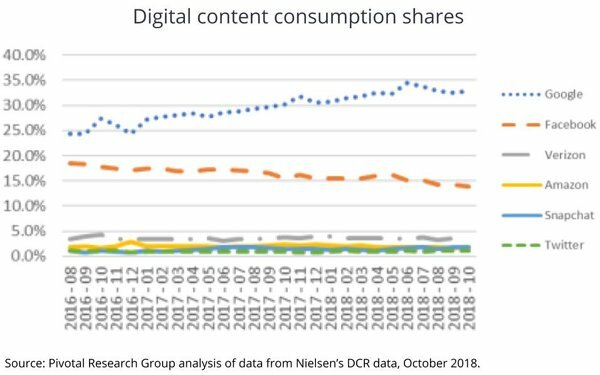 According to Pivotal’s analysis, overall digital content consumption expanded 14% during the same period, with the main beneficiaries being Google, Twitter, Snapchat and the long tail. In aggregate, Google properties (including its home page, YouTube and Waze) soared 24%. In aggregate, Facebook’s properties (including core Facebook, Instagram, WhatsApp and Messenger) grew 1%. Snapchat grew 35% and Twitter was up 31%.